A controversial US pastor has been arrested in Florida after announcing plans to burn nearly 3,000 copies of the Koran on the anniversary of 9/11. Terry Jones, 61, was stopped by police while driving a truck that was towing a large barbecue grill filled with the kerosene-soaked Muslim holy books. He had said he planned to burn the 2,998 copies at a Tampa Bay park in recognition of the victims of 9/11. Terry Jones's threat to burn the Koran in 2010 sparked widespread outrage. His congregation at the Dove World Outreach Center in Gainsville, Florida, did burn a Koran in 2011, which led to violent and deadly protests across the Middle East and in Afghanistan. Terry Jones was detained - along with his associate pastor Marvin Sapp Jr - as they drove through the town of Mulberry on Wednesday. As well as towing a trailer carrying the grill and the Korans, the pastor was also reportedly carrying extra bottles of kerosene inside his truck. Both men were charged with transporting fuel illegally and Mr Jones was also charged with openly carrying a firearm, police said. Terry Jones had previously announced on his website plans to burn the Korans at a nearby park. 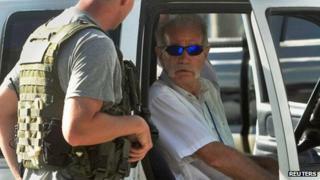 Polk County Sheriff Grady Judd said his detectives had previously warned Mr Jones that his plans were against the law. "We not only told him that he had a first amendment right to free speech," Sheriff Judd said. "We encouraged him to come to that park if he wanted to make any statements that he wanted. But he was not going to come to Polk County and violate the law."